Thanks to the Treaty on the Non-Proliferation of Nuclear Weapons, the world now possesses “only” about 14,500 nuclear weapons, down from over 70,000 weapons, the estimated peak in the mid-1980s. Most of them are hundreds of times more destructive than what fell on Hiroshima and Nagasaki 74 years ago. Recent Twitter taunts between President Trump and North Korea’s Kim Jong-un, the withdrawal of the US from the Joint Comprehensive Plan of Action (aka the Iran Nuclear Deal), and rising tensions between the nuclear weapon-possessing countries of India and Pakistan have brought the real dangers of a nuclear war to the forefront of human consciousness. Both anecdotal reports and news polls indicate rising fears about the threat of a nuclear attack. Interestingly, children have long been involved in the global nuclear weapon debate. This was clearest in the 1950s when the US government made a deliberate and concerted effort to prepare children for a nuclear attack. Duck-and-Drop drills were conducted in schools; kids were given “dog tags” so their bodies could be identified afterwards; millions of children around the country saw Duck and Cover, a partially-animated film endorsed by the National Education Association, about surviving a nuclear attack; and the Alert America Convoy toured America for nine months, offering dioramas, 3-D models, and other educational materials related to bomb preparedness. Thankfully, such scare tactics have fallen out of vogue in our educational systems. But we see renewed interest in enhancing young people’s awareness about the potential dangers of the world’s massive nuclear arsenal. The next generation, we hope, will do a better job of actively pursuing peaceful, non-violent, non-weaponized solutions to global problems. Some of the best and most direct resources come from the UK-based Campaign for Nuclear Disarmament (CND). Launched in the late 1950s, the CND is a grassroots organization that works with other entities (e.g., faith communities, other anti-nuclear groups) to combat the British Trident nuclear weapons system as well as the US Missile Defense System and the NATO military alliance. They also work to promote non-military conflict resolution and the establishment of test ban and non-proliferation treaties. Recognizing that nuclear disarmament activism must begin with young people, CND offers free, easy-to-use lesson packets. They include PowerPoint presentations, background information, timeline exercises, debate topics, and experiential activities like a talent competition and a mock criminal trial. The packets seem to be geared toward kids about age 10 or older. But some of the peace-related lessons and activities could certainly be adapted for younger kids, and some of the experiential activities would clearly work well even in a college/university setting. The packets, which can be downloaded or offered by CND’s workshop facilitators, have earned accolades from the Association for Citizenship Teaching, Think Global, and Education Resources. And, yes, one of the packets focuses on Sadako Sasaki. Any discussion about nuclear disarmament resources for kids must include something about Sadako Sasaki, who was two years old when the bomb known as “Little Boy” struck about one mile from her home in Hiroshima. Nine years later, she was diagnosed with acute malignant lymph gland leukemia as a direct result of radiation exposure. Less than a year later, she died at the age of 12. Sadako has been immortalized in children’s books, a Children’s Peace Monument, interactive web sites, and an exhibit at the Hiroshima Peace Memorial Museum. And she’s almost always surrounded by cranes. According to Japanese tradition, anyone who folds 1,000 origami cranes will be granted a single wish. Sadako, whose wish was for a world without nuclear weapons, made the cranes from her hospital bed. The museum exhibit states that Sadako exceeded her goal of 1,000 cranes prior to her death, though in several narratives she died before the cranes were finished, so the remaining ones were made by family, friends and admirers. Either way, Sadako stands as a symbol of both the horrors of nuclear war and the desirability for peace. 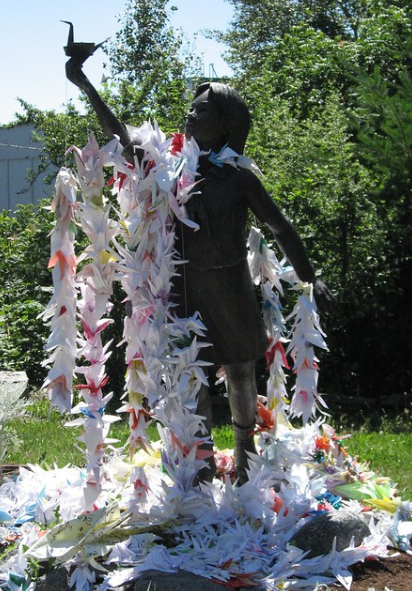 Children of all ages can hear her tale in one of the many books written about her life, and over ten million colorful cranes are donated annually to the Children’s Peace Monument. They come from around the world and are always a welcome part of the rotating display. Here in the US some of the best educational resources come from the Nuclear Age Peace Foundation and their peace literacy initiative. The curriculum team, which includes Dr. Sharyn Clough, is headed by Paul K. Chappell, an Iraq War veteran and author of the seven-book series Road to Peace. Together the team is creating free, downloadable lesson plans that can be used across the developmental spectrum – from early childhood through the college/university level. At the secondary and college/university level, there is “The Allegory of Metis,” which uses a “Socratic Seminar” approach to help students understand, in a profound way, the power of thought and the limitation of violence. The lesson includes detailed instructions, text passages, print-outs for visuals, and several sets of probing questions. Like the CND educational resources, the Peace Literacy lessons can be adapted to various age groups, and they can be applied to various cross-curricular concepts. Even though emphasis is often placed on classroom use, it’s worth remembering that all of these resources can be used by Girl Scout/Boy Scout troops, community service organizations, social justice clubs, and faith communities. If our goal is inspiring the next generation to work for change without scaring them into paralysis, these tools are an excellent place to start.